During Charles Darwin's 1831-6 voyage on the Beagle, his on-board library included 'Cook's voyages' (the edition is not specified). This illustrated 1821 edition, in seven volumes, is representative of the versions available in the early nineteenth century. 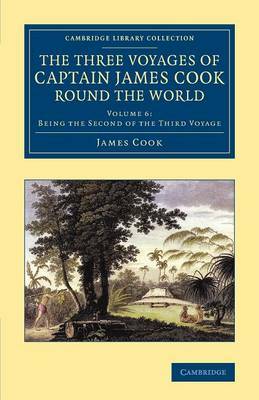 Volumes 5-7 cover the third Pacific voyage of James Cook (1728-79), which began in July 1776 and ended in his death in Hawaii. Its objective was to search for the Pacific end of the North-West Passage. Volume 6 contains Cook's journal of the voyage from July 1777 to January 1779. From Tahiti, he sailed via Hawaii to Nootka Sound, and reached the Bering Strait in June 1778. The expedition then explored the Aleutian Islands and the Alaskan coast, reaching 70 degrees north, but by late August fog and snow meant the mission had to be abandoned for that year. The ships sailed south to Kamchatka and then back to Hawaii.